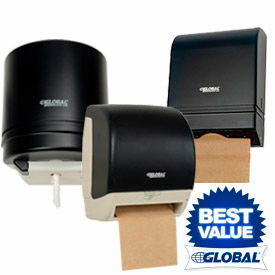 Global Industrial Paper Towel Dispensers Are Ideal For Use In High Volume Restrooms, Food Service Facilities And More. Paper Towel Dispensers are constructed of impact resistant plastic, with translucent smoke gray finishes that help indicate when paper refills are needed. Center Pull Towel Dispenser is designed to provide a fresh, hygienic supply of paper towels. Reliable, single sheet dispensing aperture self-adjusts and will not wear out. C-Fold/Multi-Fold Towel Dispenser can accommodate c-fold or multi-fold paper towels without making adjustments. Double latch top lock helps prevent theft and vandalism. Automatic Paper Towel Dispenser provides hygienic, hands-free operation. Dispenses measured amounts of paper towels to prevent waste. Adjustable settings allow operator to select sheet length, time delay between paper dispenses. Manual Paper Towel Dispensers Are Available In A Wide Selection Of Brands, Types And Sizes For Various Commercial Or Industrial Applications. 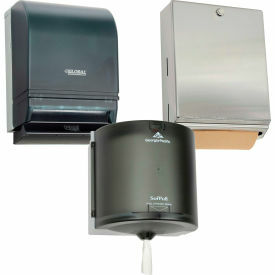 Manual Paper Towel Dispensers are made of Powder Coated Steel, Stainless Steel, Aluminum, Plastic or Oak construction for long lasting durability and dependability. A multitude of reliable brands offer wide selection of Continuous Roll, C-Fold, Z-Fold or Multi-Fold towel dispensing units in various dimensional sizes to meet particular requirement or application. Many models come with secure, lockable covers. Dimensions and color finish vary by model. Automatic Paper Towel Dispensers Deliver Measured Amounts Of Towel To Prevent Waste And Improve Sanitary Conditions. 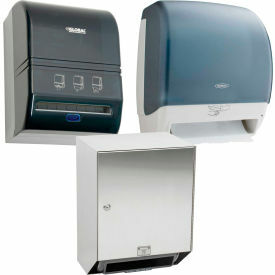 Automatic Paper Towel Dispensers are made of plastic, stainless steel or steel for long lasting durability. Variety of types, designs and finishes available to complement any restroom. Motion activated by user with automatic shut off when hands are removed from sensor range. Manual pull down roll towel dispensers also available. Colors and sizes vary by model. Combo Paper Towel Dispensers Provide Convenient Hand Drying And Trash Disposal For Commercial And Industrial Restroom Maintenance. Combo Paper Towel Dispensers are made of corrosion resistant stainless steel for long lasting durability. 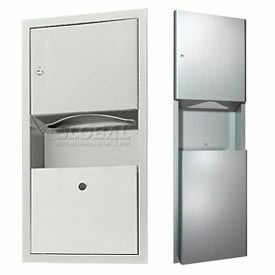 Units provide a combination bathroom towel dispenser and trash receptacle in one. Manual or automatic operations available. Available styles are C-Fold/Multi-Fold, C-Fold/Multi-Fold/Singlefold, Roll, and Stub Roll/Roll. Mount types are Recessed, Semi-Recessed and Surface Mounted. Color finish is Stainless. Quantity is 1. Dimensions vary per model.